Modern Israel is perhaps the most aggressive, belligerent nation-state in the world per capita (in absolute terms the dubious distinction would go to the USA). Created through a successful campaign of terrorism, the state has since waged a ceaseless campaign to expand its borders through violence. Israel is a de-facto apartheid regime and exerts significant (some would say controlling) influence on US foreign policy through lobbies and allies embedded within the power structure of Washington DC. A very significant faction of the Israeli people actually disapprove of their government's ongoing wars: the state cares not. As always, the astrology of the nation is descriptive. Authoritarian: Pallas indirectly trine Pluto, ruled by Mars which is indirectly conjunct Pluto. There is also a Pallas/Pluto "mundane trine" with Pallas on the Third House cusp when Pluto is on the Descendant. None of these factors is compelling in itself: the combination of them explains the strong authoritarian character of the regime. Capitalist: North Node in Taurus; Second House ruler Jupiter sesquiquadrate North Node; Moon, ruler of Venus, square the Nodes. Overall a mix of economic tendencies, which generally means a capitalist or "Rightward" lean. Conservative: Moon on MC, square the Nodes, ruled by Sun which is conjunct North Node. Liberal: Neptune sesquiquadrate Sun (ruler of Moon). The conservative tendencies are strong, as we would expect from a nation completely centered on racial/cultural/religious identity: perhaps more so than any other extant nation. We have to look for it, given Israel's ridiculously aggressive history. 1. Pallas compromised (see above). 2. Venus square Neptune (also above). 3. Venus ruled by Moon which is conjunct Pluto, which in turn is sesquiquadrate Jupiter (ruler/resident of the Second House). 4. Moon conjunct Pluto which is also conjunct Saturn (Fourth House co-ruler). 5. Pluto in Leo, sesquiquadrate Fifth House ruler Jupiter. Overall: aggressive Right-wing authoritarianism. This helps explain the dynamic in America of unquestioning support of Israel by the American Right, and mixed feelings on the Left. We libertarians denounce all aggression, period. Paradoxically, this combination of factors (compromised Pallas, mixed Left/Right indicators in both economics and culture, Bloodbath Formula) also occurs in the chart of a man without whom modern Israel would not exist: Adolf Hitler. Sun in Taurus square Leo Mars: perhaps there's an impulse here to simply do one's work and enjoy one's life (Sun in Taurus), but this pattern suggests that the drive to express one's identity in physical and even violent ways (Mars in Leo) interferes. 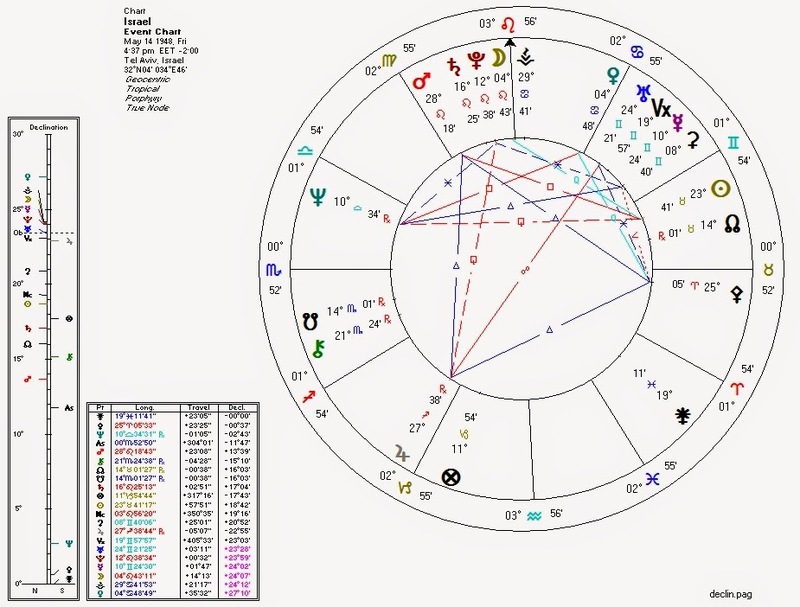 Neptune in the Twelfth, heavily aspected: suggests both a strong religious/spiritual dimension to the chart, but also the potential for unseen and/or unconscious motivations. North Node in Taurus in the Seventh House: financial dependence, perhaps, on partners (USA)? Here's the breakdown of the recent Gaza crisis by Storm Clouds Gathering. astrolibertarianJuly 28, 2014 at 8:54 AM http://nymag.com/daily/intelligencer/2014/07/hamas-didnt-kidnap-the-israeli-teens-after-all.html ReplyDelete astrolibertarianJuly 28, 2014 at 5:02 PM David Ben-Gurion's letters to his son are extremely damning. http://www.dailypaul.com/323039/how-can-this-land-become-ours ReplyDelete astrolibertarianAugust 12, 2014 at 10:18 AM https://www.youtube.com/watch?feature=player_detailpage&v=_-UwcVP_k2Y in which Alison Weir discusses pro-Israel media bias and (in the second half) the hidden history of modern Israel.